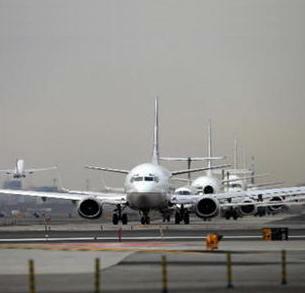 November 10, 2010 – The nation’s largest airlines reported four flights in September with tarmac delays of more than three hours, down from six flights in September 2009, with only a slight increase in the rate of canceled flights, according to the Air Travel Consumer Report released by the U.S. Department of Transportation (DOT). Data filed with the Bureau of Transportation Statistics (BTS) showed the only tarmac delays longer than three hours reported in September by the 18 airlines that file on-time performance data with DOT involved delays caused by weather in New York and Philadelphia on Sept. 22. September was the fifth full month of data since the new aviation consumer rule went into effect on April 29. There have been only 12 total tarmac delays of more than three hours reported from May through September this year, compared to 535 during the same five-month period of 2009. BTS is a part of DOT’s Research and Innovative Technology Administration (RITA). At the end of September, there was only one flight that was chronically delayed – more than 30 minutes late more than 50 percent of the time – for two consecutive months. There were no chronically delayed flights for three consecutive months or more. In September, the carriers filing on-time performance data reported that 4.81 percent of their flights were delayed by aviation system delays, compared to 5.07 percent in August; 4.60 percent by late-arriving aircraft, compared to 6.42 percent in August, 3.99 percent by factors within the airline’s control, such as maintenance or crew problems, compared to 5.16 percent in August; 0.41 percent by extreme weather, compared to 0.46 percent in August; and 0.02 percent for security reasons, compared to 0.04 percent in August. Data collected by BTS also show the percentage of late flights delayed by weather, including those reported in either the category of extreme weather or included in National Aviation System delays. In September, 34.53 percent of late flights were delayed by weather, down 0.17 percent from September 2009, when 34.59 percent of late flights were delayed by weather, and down 1.54 percent from August when 35.07 percent of late flights were delayed by weather. The U.S. carriers reporting flight delays and mishandled baggage data posted a mishandled baggage rate of 2.89 reports per 1,000 passengers in September, an improvement over both September 2009’s rate of 3.06 and August 2010’s 3.50 rate. For the first nine months of this year, the carriers posted a mishandled baggage rate of 3.59 reports per 1,000 passengers, down from the 4.02 rate recorded during the first nine months of 2009. The report also includes reports of involuntary denied boarding, or bumping, for the third quarter and first nine months of this year from U.S. carriers who also report flight delay information. These carriers posted a bumping rate of 0.87 per 10,000 passengers for the quarter, down from the 1.01 rate for the third quarter of 2009. For the first nine months of this year, the carriers had a bumping rate of 1.19 per 10,000 passengers, down from the rate of 1.26 rate posted during the first nine months of 2009.